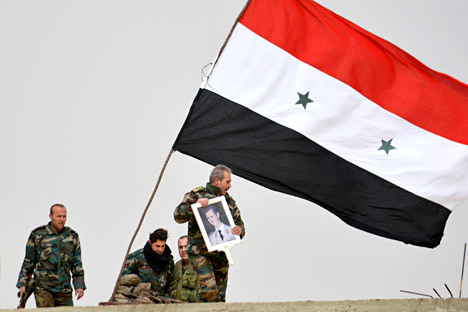 A fighter loyal to Syria's president Bashar Al-Assad holds his picture as fellow fighters rest by a Syrian national flag after gaining control of the area in Deir al-Adas, a town south of Damascus, Daraa countryside February 10, 2015. Vladimir Akhmedov, senior fellow at the Institute of Oriental Studies, an Arab specialist and diplomat who has worked in Syria and Saudi Arabia, speaks about Russian and Iranian goals in Syria, and what lies ahead for that country. Some analysts believe the main role in Syrian events is being played today by Iran, rather than by Russia. Do you agree? Vladimir Akhmedov: The Iranians have been involved in Syrian events from day one. They are well versed in the situation and are helping the Syrian government financially; it involves big money. Also, Iran is interested that a branch of the Iranian gas pipeline goes via Syrian territory, instead of the Qatari one. This example is often cited as the cause of the outbreak of the conflict. Iran has significantly strengthened its presence in Syria over the past decade. Recently, a statement was made by the commander of the Islamic Revolutionary Guards Corps (IRGC), who said that Russia "may not be as worried about whether Assad will remain in power as we are." Since the head of the IRGC is appointed by the supreme leader of Iran, it is clear that such a statement would not have appeared if it ran counter to the Iranian policy. Iran also easily comes to agreement with different forces, with the very same Muslim Brotherhood, which was shown by the events in Egypt. Some analysts believe the main role in Syrian events is being played today by Iran, rather than by Russia. Do you agree? This example is often cited as the cause of the outbreak of the conflict. Iran has significantly strengthened its presence in Syria over the past decade. Recently, a statement was made by the commander of the Islamic Revolutionary Guards Corps (IRGC), who said that Russia "may not be as worried about whether Assad will remain in power as we are." Since the head of the IRGC is appointed by the supreme leader of Iran, it is clear that such a statement would not have appeared if it ran counter to the Iranian policy. Iran also easily comes to agreement with different forces, with the very same Muslim Brotherhood, which was shown by the events in Egypt. What do you think caused the situation in Syria to get out of control and turn into a bloody civil war? V.A. : The design built by President Hafez al-Assad and which was inherited by his son Bashar was good for the conditions that existed in the region before the outbreak of the revolutions in the Arab world. Syria was the last country where a revolution was to happen, and it proved simply not ready for this – neither the authorities nor the people – in short, no one was preparing for a revolution. The system worked well and justified itself, but then it started to fail. Even before the revolutionary events, the authorities made a huge number of mistakes – in the religious, economic and social spheres. Bashar disrupted the system of checks and balances that was built and fine-tuned by Hafez al-Assad, who was able to manage it. Bashar did not meet the expectations of many Sunnis and, in crisis conditions, placed governance in the hands of the Alawite military officers. Therefore, organizations that featured many Sunnis, such as the civil structure of the party and trade unions, found themselves out of business. For the first time in the history of Syria, the minority took power, because Sunnis were removed from the government. For Syria, this was an unusual situation – under either the Turkish Caliphate or the elder Assad, Sunnis ruled alongside Alawites. Even if they were not on top, they were partners of the ruling regime. Now the Sunnis, who constituted a considerable number of the military, are not taking part in the hostilities and, according to some reports, are in the barracks. This indicates that, in addition to the Alawites, units of the Iranian militia and Lebanon’s Hezbollah are taking part in the fighting today. This means that the fate of Syria is effectively being decided by foreigners. Why were Sunnis removed from power under Bashar al-Assad? V.A. : In 2004, Syria carried out a large-scale change in the leadership of its security forces. The army went through a very serious purge as well. In turn, Hafez al-Assad acted tough in such crisis situations, taking reprisals against his own relatives. In the early 1980s, his younger brother Jamil tried to revive the so-called al-Murtada association [which contained a militia wing of Alawite Muslims and so angered the secular Baath party that was in power at the time – Gazeta.ru], when Assad was ill and briefly stepped away from operational governance. However, when the president recovered, he closed down the association, and exiled Jamil to France for a while. I think that if the elder Assad had continued to remain in power, there would have been no revolution, or it would have been nipped in the bud, as it was when there was an armed uprising by the Muslim Brotherhood in Syria in 1982. But Assad Sr. acted tough enough in the suppression of the Muslim Brotherhood. V.A. : On the one hand, yes. In the same Hama – I was there after the events, when the city laid in ruins – they just sent the tanks, and that's it. But they used different methods there. On the other hand, when, in 1979, the Muslim Brotherhood barricaded themselves in the underground markets of Aleppo under the fortress of Salah El-Din, the only possibility to smoke them out was to use gas, which could have had a wide public reaction. But Assad Sr. did something much simpler; he gathered local merchants in Aleppo and said, I give you 24 hours – either they get out without any hindrance, or you will lose your business for good. So the problem was solved without the use of gas. How do you see the political solution to the conflict in Syria? V.A. : Through Syria, we are projecting strength in the entire Middle East. I think that in the worst-case scenario, we can greatly fortify the area of Latakia and Tartus and provide serious security for our base. For the first time, the president used the word "base," because we used to call it a "material and technical support facility." But the big question is how long we decide to hold out there, and the region is such that if we have such a foothold, then they will always send suicide attackers there. Therefore, to prevent such a development, we are trying to negotiate and resolve the problem by political means. But it is not possible to do it without the Americans. Is it possible to defeat ISIS in Syria? V.A. : I think it is possible – everything that is called ISIS today is a gang composed of disparate groups who have no future in Syria, where the majority of the population – by the very structure of Syrian society – rejects them. After ISIS loses its base of support in Syria, all these people will scatter in different directions. But the main task today is to find channels that can be used to return opposition groups who fight with both ISIS and President Assad to peaceful life. There are many people of civilian professions there who have taken up arms for various reasons. What is needed are renewed political structures that would be able to give these people the opportunity to express their political interests. Hezbollah in Lebanon, which is essentially a political structure, can be used as an example here. Such a political fabric should be created in Syria, too, but this is not yet visible.